Sam the Sock was your average anklet sock; he was worn every Monday for school. Sam the Sock had an amazing life, and he loved every second of it. Sam’s best friend was named Bill who was a tall crew Sock. Bill was worn on Monday afternoons to karate practice. Sam and Bill lived together; they were also washed together. The only time the two socks were separated was when one of them was being worn. One night Sam and Bill decided to go on a brave adventure into the unknown, the closet. Sam had heard scary stories about the closet, from other socks in the drawer in which he and Bill the Sock lived. It was legend that once a sock entered the closet without his or her match, it would never return to the drawer. From the closet, it was said, that a sock would either spend years smothered by piles of laundry, suffocated by shoes, toys, games or what not’s. In the worst case it would simply be thrown out. A sock entering the closet was similar to a small school-boy taking on the daunting task of going into an abandoned house which was said to hold the ghost of a past soul. Needless to say, Sam and Bill were to very brave socks, so they headed out on an amazing sock adventure. Deep into the night, Sam the Sock and Sally the Sock began their bold venture. They swiftly began to sneak out of the drawer, making sure to keep quiet so they wouldn’t wake the other socks. After tip-toeing their way to the closet door, they slipped through the opening under the entrance, and they entered the great unknown. The two socks were amazed at all they saw; they had seen most of the things in the closet before, shoes, pants, shirts, and belts, but they had never seen all of these things at once. They wandered about, but then the socks remembered the frightening stories that they had heard from the elder socks of the drawer. Sam the Sock thought he had heard a noise, so he and Bill the Sock took off running. They slid back under the closet door and into the drawer. Sam and Bill took a breath, but tried to still remain quiet in order to keep from creating a disturbance in the sock drawer. Sam and Bill looked at each other and smiled, for they knew that they were braver than any of the socks that they lived with. Sam Bill the Sock were sure to be best friends forever. Get Softer Feet with this magical technique; if you think about it, socks keep our feet comfy, warm, and safe. 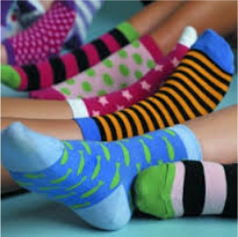 Socks keep our feet free of dust, and protect the bottoms of our feet from becoming rough and getting calluses. Now the question is, how can one enhance the usefulness of our socks? It is a question that can be simply answered if one is willing to get a little creative. Everyone wants soft feet. Although socks do keep your feet softer than they would be if one was to walk around barefoot all day, socks are not reaching their full potential. What are two things that assist in keeping your feel smooth? That’s right, lotion and socks. What if there was a way to utilize the best of both? Well if you’re up to trying something new, there just might be a way to combine the best of both. How does easing your foot into a pleasing pool of creamy lotion sound? At first thought it may sound strange and unattractive, but we were always taught not to judge a book by its cover, so you need to try this before you shoot it down and use socks for a magical experience. It may even be uncomfortable at first, but after a while, it’s like your foot is being pampered. So take a chance; sit back, relax. Just slip on a sock full of lotion, and let the magical, soothing love take place. Your shoes offer you a lot of protection and honestly you don’t see many modern day human types running around without them. So technically the most protective part of your wardrobe is your socks. Sure they wick and absorb sweat but your feet probably wouldn’t sweat in the first place if you didn’t wear shoes. There are a lot of human cultures today that still don’t wear shoes and socks. Generally you’ll only find them in places where there aren’t many modern day inventions like shards of broken glass, gravel roads, pieces of sharp metal lying around and other newly shattered inventions. Sure if you run around in bare feet enough you will build up a thick layer of skin on the bottom of your feet but they will only take so much abuse. 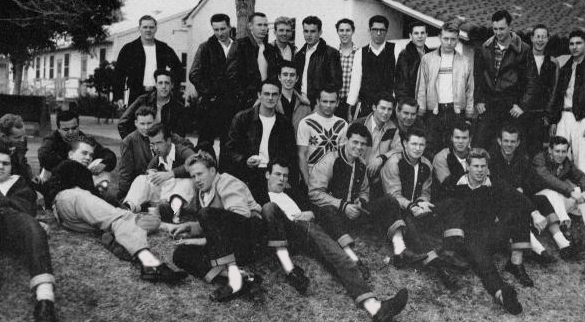 The History of Crew Socks began in the mid 40’s. They are a medium size sock that falls somewhere between the ankle and the knee. Crew Socks are the work horse and most popular sock in the industry. Worn by men, women and children with casual, formal wear or even while playing sports. They are usually thick everyday socks which are ribbed above the top of the ankles. Usually made with a bled of cotton, polyester and spandex. The cotton in the crew sock gives it the ability to absorb and wick away sweat. The foot actually produces more sweat than any part of the body. This helps provide a tremendous advantage keeping your foot both warm or cool and extremely dry, especially during different hot or cold weather conditions. The Polyester gives the blended fabric added strength while the spandex gives it the ability to stretch. 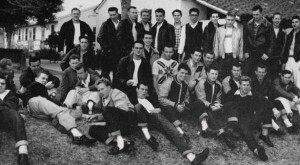 The Crew Sock first began to become popular in the late 1940’s. The story has it that there was a gang run by a leader who was a rather tough guy named Kelly. What distinguished them from everyone else was the kind of white crew socks they wore. One summer day there was a robbery in a local convenience store and Kelly’s gang ended up saving the day. They started working with the police force in some of the worst neighborhoods in town. A young reporter, Kassandra Philippin made the group known through the local newspaper and turned them into very popular folk hero’s in the area. She also canned the name “CREW SOCKS” in her articles which lives on even through today. Get together with a bunch of your crew and order some of the most popular socks around. The are available in Black, White and Brown. If you need specific colors let us know and we can probably find them for you. “Sock it to me”, an expression that became popular in the late sixties made popular by Judy Carne far left in the above photo and even used by President Nixon. But, where did it come from. Where is it going? My son who is 26 has heard it before but doesn’t know where. So I looked a little deeper. Socks from what I could find started as far back as 700 BC Greek farmers were known to line their boots with felted wool for extra comfort and a little protection from the elements. When the Romans first invaded Northern Europe, then called Gaul they wore what they called udones which were the first sewn foot coverings. Udones were also made from wool and were worn both as lining for your boots or just by themselves as a simple foot covering. No one knows the exact first time they were worn or invented but were fairly common through the second century. The first pair of knit socks appeared shortly after this. Guess they had to discover how to knit fist. I find it fascinating that socks are still knitted today even though the process is almost totally automated. The socks at that time were made using a one stick knitting process. Examples were found throughout Egypt, Syria and Holland. The process at the time was complicated and extremely rare. It only began growing in popularity in the 12th century but usually only for the privileged. Stockings only started becoming popular in the 17th century when most people could afford a pair or two for themselves. From that point on the process grew and the art of knitting socks got better and better. Around the time of the civil war when at times weapons and ammunition became rare the fighting needed to continue. Often a few soldiers were sent into combat with only one rifle to share. Improvisation was often needed. It is said that this was about the time the “Sockdolager” was invented. Basically a large heavy link from a ship chain dropped into a sock was the first inscription of this weapon. Extremely crewed but very effective. Of course there have been many variations on this basic idea over the years leading all the way up to the black jack which is made of leather wrapping a lead weight and still used today. So the expression sock it to me originated during the civil war as sock it to them, or “sock them” and “Why don’t you sock them in the nose?”. Variations were used on and off in everyday language until the late 60’s when a small very cute blond girl “Judy Carne” used the expression while doing a dance in a string bikini on the TV show “Rowan and Martin’s Laugh In”. It’s kind of interesting that the expression around one hundred years old began to bloom and become popular again. In my opinion at the time it was simply a cute girl in a small bikini at the time would make any phrase popular. When you think you need some new socks,” Sock it to us”! We could use the business. Maybe you were thinking red white and blue. I guess if you’re going to represent our country the conservative route is best. It’s my opinion that a black or white sock is the only sock you’ll ever need. If you want to stand out in the crowd do it with your air craft carriers or just your personality, not your socks. Playing sports, what color then? I’d suggest white. 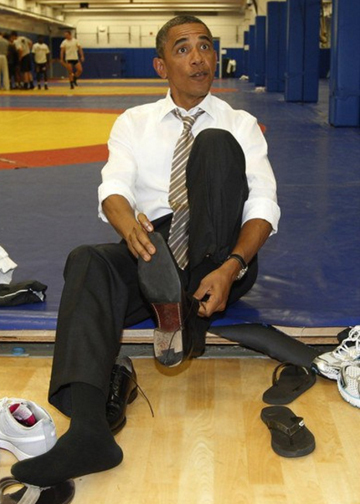 Presidential Socks, come on now could you really imagine the President of the United States wearing anything else? Bet you didn’t know…your feet are the sweatiest part of the human body, right up there with the arm pits and head. Socks play a huge role in wicking away the sweat away from your feet so the moisture will evaporate, It is actually possible to lose up to a half a liter of sweat a day through your feet. Mix and Don’t Match, The New Sock Fashion Trend ! We might not recommend this for anyone over 18 unless you really, really want to stand out in a crowd. A tendency of late is to mix and match, show your creativity and get a bigger bang for your buck. Buying two pairs of colorful socks can give you for several combinations of socks. A bigger bang of creativity and a bigger bang for your bucks. As a parent don’t fight it because it just makes life easier. Kids are kids and no one will think twice about it. If you’re the one stuck doing the laundry it just seriously knocked some time off your job. That one sock with a hole in it is no longer a problem. You still have another left. Who knows lets keep up the good work and the future will be left with more time to tackle some more serious problems. Our focus on Black and White Socks is Value. Who is a Black and White Customer? Our customers don’t need to bring attention to themselves through the uniqueness of their socks. They have other more important features like a winning personality, a positive attitude towards life and an l can do type attitude. 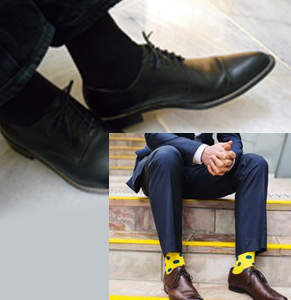 Typically they are a practical conservative individual that likes to keep things simple, take advantage of great value and avoid standing out unnecessarily in a crowd because of their brightly colored and over priced expensive socks. That’s not to say that a Black and White Sock customer isn’t fashion conscious. A lot of our customers love nice fashion and spend the money for it. There just happens to be better things to spend extra money on then socks. Most people couldn’t answer this question. 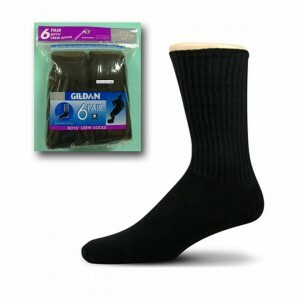 We sell Gildans Brand Crew socks fir $30.99 including shipping. It’s a famous brand, quality crew sock. It just happens to be the sock that I wear almost all the time. They fit just right and are extremely comfortable. Plus if you decide to buy an extra dozen or maybe a dozen of another style you save an additional $10. In fact you save an additional $10.00 for every additional dozen you order after that. Plus if you happen to need to put together a large order of over a dozen pair, don’t be afraid to call us an let us prepare a special price for you.Now check this out. It’s probably pretty rare for someone to send you to another competitors site but go to blacksocks.com and check out their prices. We give an additional 9 pairs of socks for only 99 cents. I can’t say any more. Try us you’ll Love us.